67-73 car owners have a lower control arm eccentric but the round nature of the stock design doesn't positively lock the lower control arm into position. Today's modern sticky tires can overpower the stock eccentric bolt and move the lower control arm, messing up your alignment. 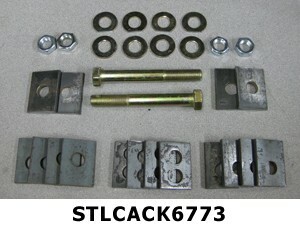 The square tabs included in this kit positively lock the lower control arm into position. STLCACK6773 67-73 Mustangs & 66-70 Fairlane.